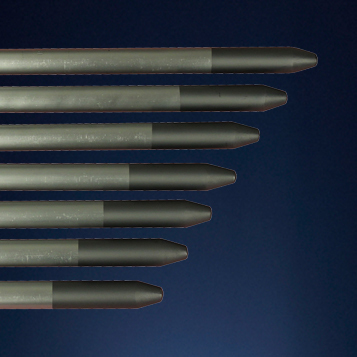 Metal pipe thermocouple protection tubes are an economical alternative to thermowells machined from solid bar stock. They also allow the protection of very long thermocouples. This would not be possible with a machined thermowell. Metal pipe style protection tubes also allow the flexibility of using ceramic bead insulated thermocouples or MgO thermocouple elements. Arklay Richards can manufacture metal pipe thermocouple protection tubes for difficult temperature monitoring and control applications with extreme heat, corrosive or abrasive environments. Metal Pipe Protection Tubes can be fabricated in a variety of metals including Austenitic and Ferritic Stainless Steels, High Nickel Alloys, Low Carbon Steel, Titanium and other specialty alloys. 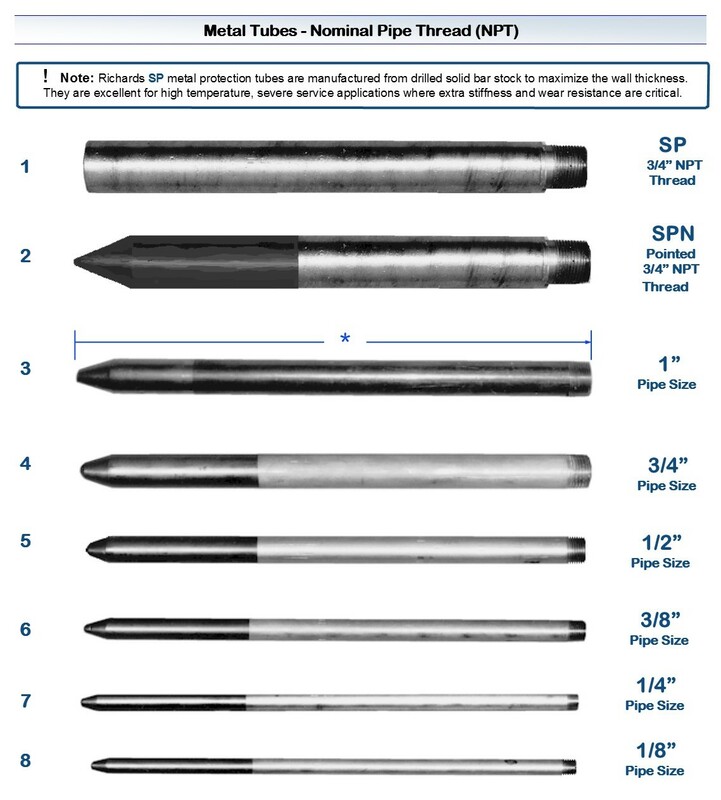 Metal pipe protection tubes can be made with pipe from 1/8" NPS up to 1 1/4" NPS. 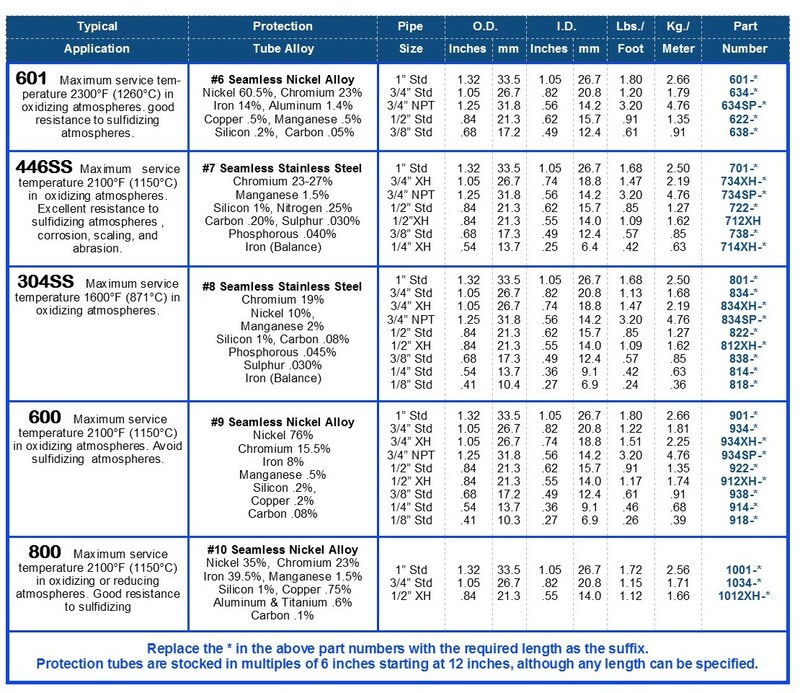 No matter how difficult your specific application, we can help you select the proper metal protection tubes. Simply call one of our sales engineers and state the quantity, temperature range, conditions and length of metal protection tube you require. 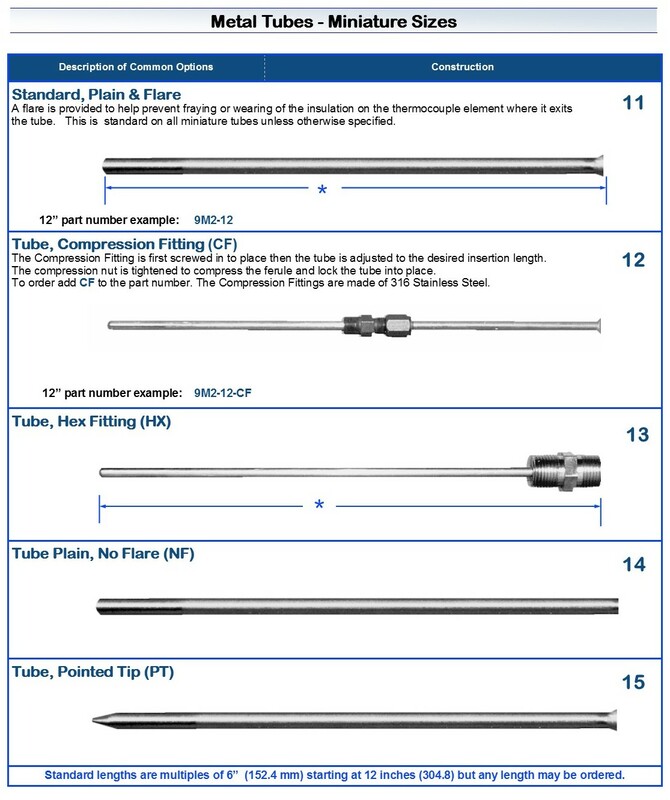 Richards metal thermocouple protection tubes are manufactured using our special processes to maximize the tube service life. This is evident by our uniquely shaped, heavy mass tips which have been proven in the field for years. Prior to shipment, each tube goes through our Hydro-Pneumatic testing to check for porosity. Protection tubes are typically made with a closed tip and one threaded on the cold end, but they are also available with open ends and various threading options. The part number 601-YOBE-12 signifies a 1” O.D., Alloy 601, Open Both Ends, and no thread. Part number 601-OBE-12 signifies a 1” O.D., Alloy 601, Open Both Ends, and one end threaded. 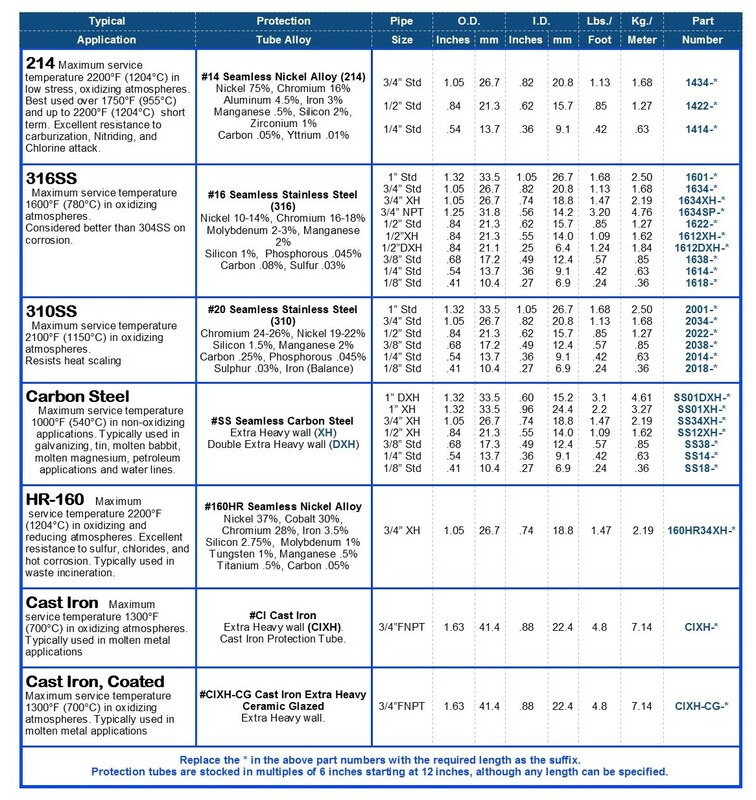 The part number 601-OBE2T-12 signifies a 1” O.D., Alloy 601, Open Both Ends, and both ends threaded. The part number 601-12 signifies a 1” O.D., Alloy 601, closed one end, and one end threaded. 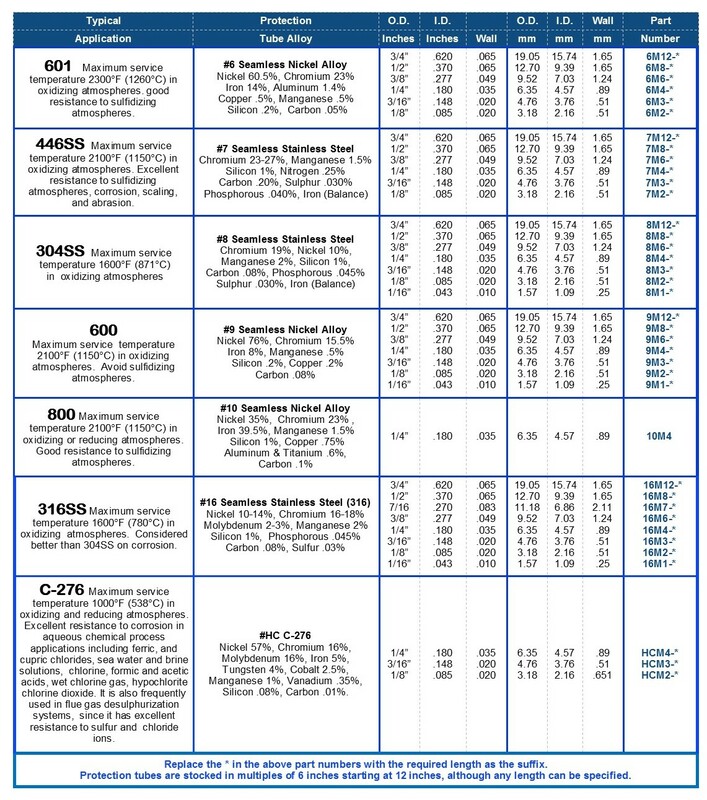 The part number 601-12-NT signifies a 1” O.D., Alloy 601, closed one end, and no thread. One piece metal protection tubes can be made up to 21 feet in length. One piece to 21 feet in length.